**After reading journal entry, see photo gallery of the orphans and the leper colony on "photo gallery" page. The joys of jetlag have set in :-) The first night we were here, we slept 5 hours and felt great the next day. Wednesday night I went to bed at midnight and woke up at 3:00 a.m. UNABLE to get to sleep again. So yesterday we had a FULL FULL day, came back to the room and I zonked at 7:00 p.m. Now I woke up feeling like it should be 8 am, hoping it was at least 5 or 6, but it is only 1:00 a.m. and I absolutely can't sleep again. Yikes! Yesterday was an amazing day! We were picked up at 9:00 in our "rental car." In India, when you rent a car, you get a driver with it. I thought he was kind of expensive for India ($50), but we did do a lot of driving and he had to just wait for us wherever we went all day. The driving is exactly what I've been told but I'm not very nervous because the drivers are very competent. I just don't get how they keep from grazing mirrors and such because we come within inches of the other 8 cars, buses, "autos" (very small vehicles), and motorcycles all packed into 3 lanes. And the horns are a true language of their own. It is interesting to see how they use them. I think I have figured this all out though...the most aggressive drivers MAKE the rules and everyone else complies. We had a very aggressive driver today and I learned some new moves to try out when I get back home. In the morning, we went to the Delhi orphanage first and we got to try Chapatti. This is Indian bread that they make fresh every meal. The orphans here (270) are divided into work groups of about 8-10. They take turns with different duties each day, making their own food, cleaning, and whatever else. The cook group is fascinating to watch while they make their Chapattis. They are all in a room, mixing, kneading, rolling out, and cooking over a big "grill." I tried the bread both un-fried and fried and of course fried tastes even better. They also gave us some authentic soupy stuff that is HOT HOT with curry (a generic term for spices in India), but they watered it down for us westerners. How can I tell you how beautiful, sweet and loving the orphans are? They are SO happy and full of life. They want to play, sing, hug, joke, and talk to you constantly. And they LOVE getting their picture taken. It is hard to get pictures of individuals because as soon as you pull out a camera, it is like flies on hamburger. Pretty soon you have 200 kids from the whole neighborhood, pulling at your arms wanting their picture taken. Their smiles are big, bright, and sincere. They are so well taken care of. Next, we went to two leper colonies. 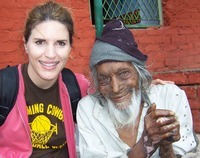 The very first leprosy-affected person I saw was sitting down on the ground with all his extremities rotted off. He had about 2,000 flies all over him and he was so thin and old. I found out he liked his back rubbed and scratched, so with great joy, I sat down next to "Jesus" (when you do it for the least of these, you do it for Me), and gave him a good back rub. He was so grateful and smiled a big toothless grin. The great thing about the leper colonies, sponsored in part by Hopegivers, is that NOBODY in the colony is still contagious. They have all been medically treated and are cured of the possibility of spreading the disease, even though there are deformities in varying degrees from previous infection. The colonies were very nice and clean and the people were very warm and friendly. Their families live with them at the colonies and thanks to Hopegivers and other ministries, they have been given trades and jobs for income so they are mostly self-supporting. They make soap, sew household goods, fabric, and have poultry and dairy farms. They were very clean. One colony is built over the city sewage system but you couldn't smell anything and it too was neat as a pin everywhere you looked. While Hopegivers offers schools and a chapel for the children in the colonies, they do not force Christianity on anyone and very few of the lepers in the colonies are actually believers (except that the kids are growing up with the influence of the Christian school and workers). And while there is a chapel for church services, there is also a Hindu temple right next to it on the premises. I think it is very good that they respect everyone's beliefs, offering them love and practical help so unconditionally. There was a mission team with us at the first colony today. It is a group similar to Teen Mania called, "AIM" and the young people are near graduating high school or college age. They are here for 3 months just to teach and work with the kids every day at the orphanage, and also at the leper colony. It is so cool to see them, especially the young men (I saw about 5) so tenderly hugging the lepers, holding the kids, and teaching them. Stay tuned for more journal and pictures to follow! Woah! I’m really enjoying the template/theme of this blog. It’s simple, yet effective. A lot of times it’s tough to get that “perfect balance” between usability and visual appearance. I must say you have done a amazing job with this. Additionally, the blog loads very fast for me on Chrome. Excellent Blog! Just wanna comment on few general things, The website pattern is perfect, the content is real excellent : D.
I like this weblog quite considerably, Its a rattling good billet to read and discover information .